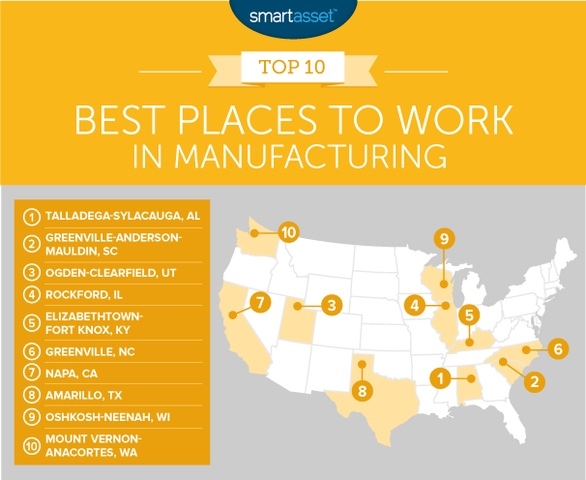 The Talladega-Sylacauga Micropolitan Statistical Area was rated the best place in the U.S. for manufacturing jobs in a detailed analysis by SmartAsset, a financial technology company that studied data on nearly 500 cities. “A large chunk of the workforce in this Alabama metro area work in manufacturing – just over 39 percent. Only three other metro areas in this study can beat this stat. The Talladega-Sylacauga micropolitan area consists of Talladega and Coosa counties, with a total population of around 93,000. The area’s top employer is Honda Manufacturing of Alabama, which operates an auto assembly plant in Lincoln with more than 4,500 workers. “Alabama has a strong heritage in manufacturing, and it remains an important pillar in the state’s economy,” said Greg Canfield, secretary of the Alabama Department of Commerce. Manufacturing workers in Alabama total more than 260,000, representing more than 13 percent of the state’s workforce. That’s the fifth-highest concentration among the states, according to data from the National Association of Manufacturers. To identify the best places to work in manufacturing, New York-based SmartAsset looked at data for 483 metro areas in the United States. Specifically, the firm looked at data on employment growth in manufacturing, income growth in manufacturing, density of manufacturing jobs and housing costs. The number of manufacturing jobs in the Talladega-Sylacauga micropolitan area expanded by 3.4 percent in the past year, reaching 39.4 percent of total jobs, according to SmartAsset’s data. Incomes, meanwhile, climbed 6.2 percent over the year. The area’s annual income after housing figure of $58,461 was second-highest among cities making the list’s Top 25, and it was more than $10,000 higher than the city ranking just behind it on the overall list. “Manufacturers rely on the skills of their workers for success, and the talents of manufacturing workers in the Talladega-Sylacauga region are highlighted by this impressive ranking,” said Ed Castile, deputy Commerce secretary and director of AIDT, the state’s primary job training agency. The Talladega-Sylacauga area ranked No. 11 in the 2016 installment of the SmartAsset analysis.